Ben Wong (黃智賢) and Yoyo Chen (陳自瑤) filmed a wedding scene in their new drama Golden Crime <黃金有罪> recently. The artistes shared their honest insights of maintaining healthy marriages with their respective partners. 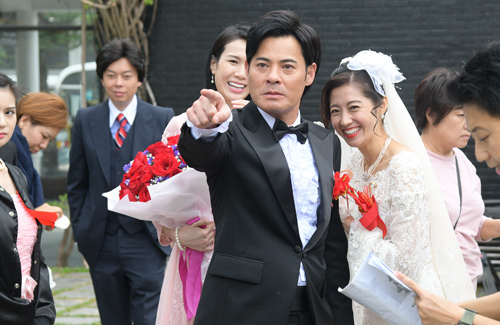 In Golden Crime, Ben portrays as a hot-tempered rich second generation while Yoyo is his bitter wife who is continuously hounded by his family. During the filming of the wedding scene, both wore wedding outfits from the 1970s to suit the era. The appearance of Yoyo’s ex-boyfriend causes him and Ben to get into a heated scuffle, while wedding guests were seen having to pull them apart.